KAMPONG SPEU, Dec. 20 (ChinaMil) -- The "Dragon Gold 2016" joint drill featuring humanitarian rescue and disaster relief exercise between China and Cambodia kicked off in Kampong Speu Province of Cambodia on December 18，2016. This is the first China-Cambodia joint military drill aiming to deepen pragmatic cooperation and enhance the friendship between the two militaries and two countries. Troops of the two sides have conducted theoretical discussion and exchange, command post training, as well as six actual troop military training courses. During the theoretical discussion and exchange phase, the Chinese commanding officers gave presentations around the strengthening of capacity building, training and command of the engineering force to carry out military operations other than war (MOOTW). Combined with the experiences in MOOTW including earthquake relief, fighting against freezing rain and snow disasters and floods, Chinese commanding officers also briefly introduced the concept, development status and experience of the Chinese engineering troops' capability in MOOTW. Meanwhile, the Cambodian side gave a report on water rescue and fire fighting. Chinese commander Ye Fangchao said that the MOOTW have become increasingly important for forces around the world and thanks to the unique equipment, expertise and talents, the engineering corps has become an important part in such operations. The commander of the Cambodian side expressed his willingness to further study and learn from Chinese troops' experiences and practices in order to further enhance the Cambodian army's ability in rescue and rescue operations. 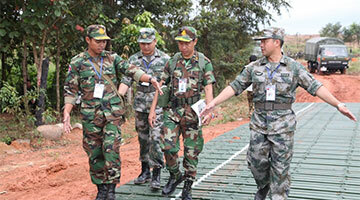 The command post training and actual troop training courses were conducted in the background of a flood and waterlogging disaster in a certain area in Kampong Speu Province. The rich experience, advanced equipment and excellent performance of Chinese troops participating in the rescue operations have won the applause and praise from Cambodian counterparts. "Chinese soldiers not only have advanced equipment, but they are also very disciplined and tough," said a Cambodian officer who has studied in Chinese military academies for three times. He believes that "Chinese soldiers have a lot of good qualities worth learning".